How We Met: My big sister, Lonnice (sounds like Lon + niece), had a pop collection to die for and during one of my 3 or 4 hour listening / singing sessions I stumbled across “The Magazine.” I asked my sister where in the world she got THIS and she said she was introduced to Ricki’s music from one of her girlfriends. Well I had never heard anything like it; her stuff blew my mind when I was a kid and still does. It was my first major introduction to a singer that played piano (so well) and wrote her own stuff; it carried a lot of weight and was so impressive to me. Getting to Know You: Born in Chicago, Illinois on November 8, 1954, Ricki Lee Jones came from vaudevillian grandparents and a father who was a musician and singer songwriter; super artistic folk. Ricki turned out to be a vocalist, musician, songwriter and producer. Her career has lasted for more than three decades and her prolific body of work features a wide variety of musical styles including rock, R&B, blues, pop, soul, and jazz standards. 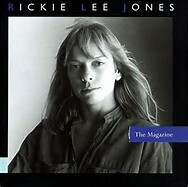 Ricki Lee Jones released her first album (self titled) in 1979. She won a Grammy in 1980 for “Best New Artist” and was also nominated for Best Album, Best Pop Vocal, Best Rock Vocal, and Best New Song (you will know her probably from her first major hit, “Chuck E’s in Love”). Jones has 16 albums to her credit and is still creating! She is set to release a 17th album entitled, “The Other Side of Desire” June 2015. In addition to “The Magazine” I’d recommend you to check out her album “Ghostyhead” from 1997. I find I am often entranced by her interesting speak-singing, raw, real way of delivering a song for example: “We Belong Together” from her “Pirates” album https://www.youtube.com/watch?v=gNgSb1TGGcQ. Endearing Qualities: There is so much to love about this song. Initially, I dug the groove followed by the lyrics. The all too familiar question repeated throughout that we’ve all asked “What’s the matter, don’t you want me?” hits home but what really won me over was how the piece increasingly builds the closer you get to the end. The horn parts are spot on (orchestral arrangements by Johnny Mandel) and very well done and I find it hard to not clap, snap and rock my body by the 3:50 minute mark. The production is like pop meets big band then heads to Broadway for a show. Sooo? What do you think? Post your comments below.